Can I remember hearing Bohemian Rhapsody for the first time? No, not clearly, like I can a few other songs of the time, but I certainly remember the impact. Could I believe my ears? I had to but there was so much to digest. It happened somewhere in the fall of 1975. The world still has not totally dealt with the song as it is the seemingly forever number 1 in the Top 2000, that yearly musical feast on radio of all things. 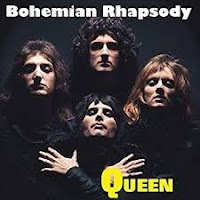 'Bohemian Rhapsody' is Queen's most famous song from its best album, 'A Night At The Opera'. And of course it is the title of the Freddy Mercury bio pic. What else could it be? The larger than life song symbolising the life of the larger than life entertainer. The film shows the part of the entertainer the world never sees, except for the stragglers and hangers on profiting from his insecurity and inner loneliness. It turns out that Farookh Bulsara was a man like most: "insecure, doubts, looking for love and fronting a mask for the world to see". "Come back when you like yourself", is the most truthful sentence in this movie. Spoken by a man who would turn out to become his true love a few years later, I hope for Freddy. A nice, subtle touch is the 20th Century Fox tune at the start of the movie. It got a special treatment by the hands of Bryan May. 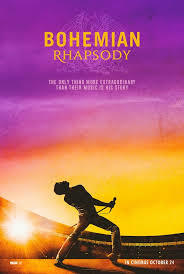 In the reviews critics gave off on the most likely influence the remaining Queen members had on the moviescript. If true, luckily they did. At least we got to see something of the inner band struggles and how the music got to be and not only doped up gay scene parties of the late 70s and early 80s. The musical part is what makes this movie more interesting. True or not, the few notes played from his bed with then girlfriend Mary, would become Bohemian Rhapsody much later and shows how inspiration can strike at any moment. It is a magical moment shown to us, just like the idea Bryan May had to give the audience their own song, turning into 'We Will Rock You'. It is moments like these that made the movie a success for me. The final scenes are fantastic. I remember being amazed by Queen at Live Aid. Seeing the audience respond en masse to a song I did not like at the time at all, 'Radio Ga Ga'. The video had inspired a 100.000 people to act along. The power of this band returned to me totally, although I never fully recovered from the switch to pop and disco. 'I Want It All' from 1989, beyond the movie, remains one Queen's best though. Rami Malek never fully convinced me as Freddie Mercury. A far cry from what Val Kilmer did with Jim Morrison and I fully understand why. Morrison was dead before I could ever have seen him play or saw him "daily" on tv. Freddie Mercury did. He was everywhere and I had seen him play twice in the 70s. Despite having Freddie's moves and all, he remained an actor playing Mercury that I had seen in other movies as well. It was the Brian May and John Deacon characters who convinced me most. Mercury makes a too hard image to beat. Except in the live footage. There it mattered less somehow, as the music took over. One thing remains. That no one in the audience got the Mike Myers/'Wayne's World' joke is beyond me and I never even got beyond about ten minutes of this terrible movie. It's always strange when you're the only one laughing. I thought it a good one. So, summing up. Yes, a fair movie, not exceptional like 'The Doors' was (to me), with of course great music being explained in all the right places. And whatever happened to that Tim character from the band Smile? He made some money because of this movie you know. Wrong choices are from all ages. Even in music. For what was to become Queen, it was the best choice ever.